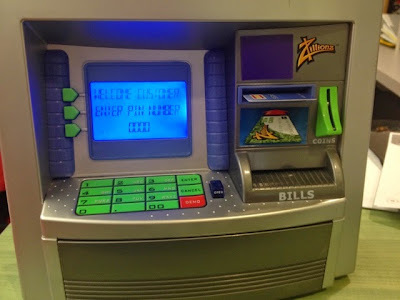 You might remember a while back I asked for advice on what to use for a credit card swipe machine for my students to practice on and enter their PINs and you came up with a lot of great suggestions! 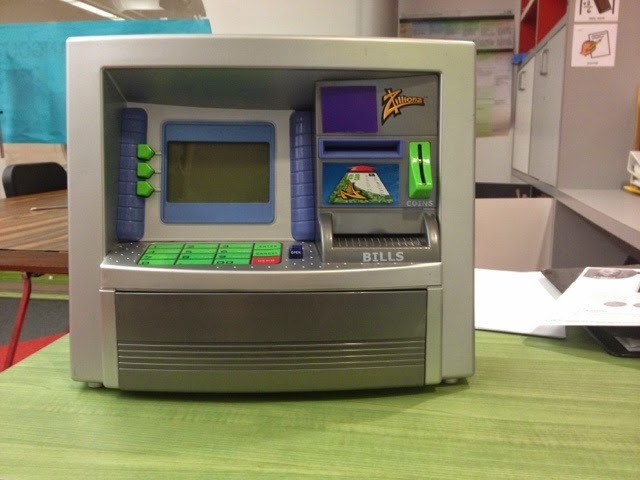 One of those was this Zillionz ATM machine...but it was a little expensive! I think because it probably isn't sold in stores anymore. So I gave up on that decided to start asking stores if they had any old swipe machines they wanted to get rid of! LOL I asked once and then chickened out. I had just about given up when....I found this in our school store (where teachers/parents donate items for students to buy with their hard earned school bucks)! Now, for how I use it in my classroom. We use the Banking for Non-readers curriculum and we have pretend debit cards that we use for practice. This machine turns on with any card inserted, so that was perfect because each student could use their own card! Whenever we got to a lesson that used the ATM machine (or depositing money into the bank or buying something with a debit card, etc), we used our ATM machine! Now for the PINs, since each of my students had created their own PIN, I was afraid this would be a challenge. However, I looked up the instructional manual online and found you can change the PIN by entering the current PIN, pressing enter twice and then entering the new PIN. So I would walk around like a crazy person dedicated teacher, and change the PIN for each student. Why, yes, I did memorize each one of my students' PINs, that's not weird, right?? 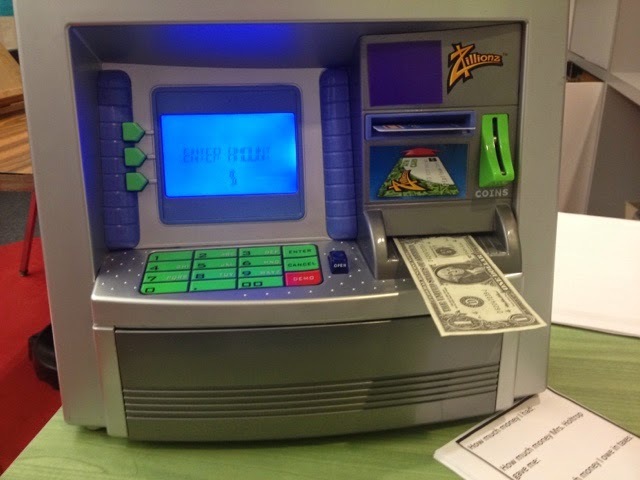 As you can see, you can insert pretend money as well! I was also very excited about this feature (I may or may not have been jumping up and down with excitement as I was figuring all this out). The machine has no idea of the amount, but that's okay. A huge downside to this ATM was the volume with no controls. It was LOUD. Seriously, all caps necessary, LOUD! My ears were ringing after playing with it for a while. So, I filled the volume holes with putty and taped purple plastic over it...and that at least helped a little bit. My students didn't seem to mind the noise anyway, so that's really all that matters! It definitely isn't perfect, but it's a whole lot better than my students sliding their debit cards in the air or on their paper and entering their PINs on a calculator... :) If you are looking for one to use in your classroom, this ATM looks like the same thing just in different colors, and is just under $30 (or this smaller ATM by the same company, a little different but under $8!). Do you use anything else to practice skills like this? I'd love to hear what you use! I laughed about the part of memorizing all their pins. I have memorized most of their computer usernames and passwords, because they need help with that so much. Thank you so much for the update. I've been wondering if you had found an ATM for your students. I like your feedback regarding the pros/cons and how you resolved the cons. Thanks. You're welcome! Thanks for thinking of me! And I'm glad to hear you like posts like this :) more motivation for me to keep blogging abou random classroom stuff!! This is such a great idea! I love that you are teaching the students about banking. It is an art that I wish we had been taught in school. where did you get the card? are they blank visa gift cards? Great idea! We have some fake ones from a banking unit we had purchased years ago. Blank visa gift cards or the fake mail offers would work great! Can the ATM hold up to more then one pin? If not, how did you do this with your students? Did they all practice using the same pin number? No. So I would change it each time! "I looked up the instructional manual online and found you can change the PIN by entering the current PIN, pressing enter twice and then entering the new PIN. So I would walk around like a crazy person dedicated teacher, and change the PIN for each student." Bowling Unit and Sports Themed Giveaway!